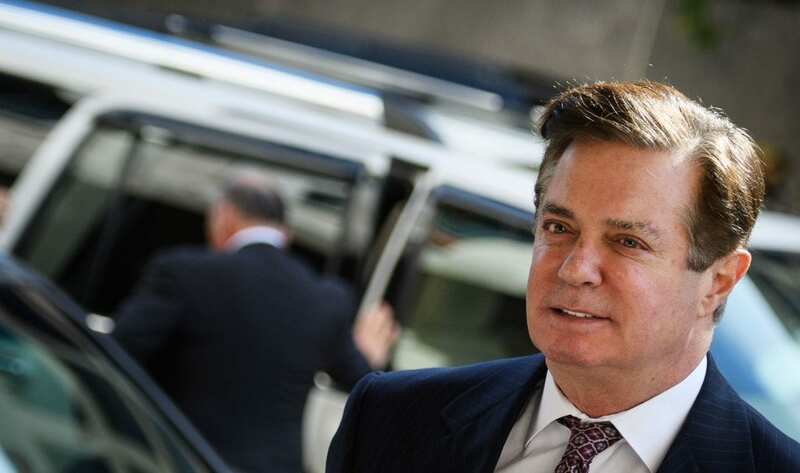 The trial would have been Manafort’s second; he was convicted last month by a federal jury in Virginia on eight of 18 counts in a bank and tax fraud case related to money he earned in Ukraine. The judge accepted his plea, and asked him about his cooperation agreement. “You are agreeing to cooperate fully and truthfully with the investigation by the office of special counsel. Do you understand that?” she asked. Under the deal, Manafort agrees to cooperate in any and all matters as to which the government deems the cooperation relevant. That includes testifying fully and completely before a grand jury in Washington, D.C., or elsewhere, according to the plea agreement. It was not immediately clear what information Manafort might provide prosecutors. But he served as Trump’s campaign chairman during the critical summer months of 2016, and he attended the now-infamous meeting at Trump Tower that June with a Russian delegation offering dirt on Hillary Clinton. Manafort’s camp has long denied that he has any information to offer Mueller’s team, including about possible coordination between Trump associates and Russia during the presidential race. The plea agreement announced Friday covered Manafort’s work as a lobbyist for former Ukrainian President Viktor Yanukovich and his pro-Russian political party. Yanukovich was toppled by a popular uprising in 2014. Manafort did not register his lobbying work with U.S. authorities, as required by law. He also hid the millions of dollars he made in Ukraine from the U.S. government and asked witnesses to lie to the jury in the trial he has now avoided. Despite Manafort’s job leading the campaign, the White House has sought to distance itself from him and his case. During Manafort’s Virginia trial, the president had spoken spoke warmly of him. He called Manafort a “good man” and said he had been unfairly targeted by the Justice Department — sparking questions about whether Trump might pardon him. Giuliani has told NPR that Trump discussed a possible pardon earlier this summer, but he said the president agreed not to move forward with the idea. Manafort’s guilty plea Friday appears to set that question aside, for now, although it does not close the door on the possibility in the future. As part of the deal, Manafort has agreed to forfeit four properties in New York and Virginia, as well as funds held in several bank and investment accounts and an insurance policy. The plea agreement, meanwhile, makes clear that the special counsel’s office will maintain leverage over Manafort. Proscutors won’t dismiss the other five counts Manafort faced in Washington until his cooperation is complete or he’s been sentenced, whichever comes later. The government can also file a letter later seeking leniency from the judge in Manafort’s sentencing, depending on his cooperation. Ahead of the hearing, Mueller’s office filed what’s known as superseding criminal information. It spelled out the two counts to which Manafort has pleaded guilty: conspiracy against the United States and conspiracy to obstruct justice. It also contains around 40 pages of government exhibits, including emails, strategy documents and other evidence prosecutors would have likely presented during a trial. Harry Sandick, a former federal prosecutor in New York, says it’s uncommon for criminal information to include that level of detail. In other words: “‘If you don’t think we’re doing something important, read this,'” he said of the filing. Manafort, 69, earned tens of millions of dollars lobbying for foreign governments and spent that money freely, including on a $15,000 ostrich coat, landscaping and real estate. But by 2016, his financial situation grew dire. He volunteered that year to work for free on the Trump campaign, shepherding the candidate through the Republican National Convention before being pushed aside as questions about his influence-peddling emerged. The longtime political operator who had advised presidents from Gerald Ford to Trump has been incarcerated since mid-June, when Judge Jackson ruled he posed a flight risk and a danger to the community. Behind bars in the Alexandria, Va., detention center, Manafort’s dark hair has sprouted patches of gray. During his Virginia trial, he sometimes refused to wear socks because he didn’t like the look of the white jail-issued socks with his dark footwear. Manafort’s legal team blamed most of his problems on former business partner Rick Gates, who pleaded guilty in February and testified against Manafort in Virginia. “I had hoped and expected my business colleague would have had the strength to continue the battle to prove our innocence,” Manafort said after the Gates plea deal earlier this year.